You've seen my many North Shore posts HERE, HERE, and HERE, but this time, I have something new for you! I've been hearing so much about Kahuku Farms Cafe that I had to make a special stop on my next Kahuku trip. I was told by a colleague to try their Veggie Panini, and I went there specifically for that. However, as we walked in, I glanced at all of the pictures and signs advertising homemade ice cream, smoothies, fresh fruit and more. Not to mention, we had just eaten three plates of Giovanni's shrimp, it was the middle of the day and a scorching 90 degrees. So instead of the Veggie Panini, we decided on some Iced Teas with a scoop of sorbet, and also Fried Banana Bread ala modé! Verdict? Well, talk about mouthwatering. That Banana Bread came out nice and warm and fried to perfection. I couldn't get over how moist the middle of the Banana Bread was! Definitely the most luscious Banana Bread I've ever eaten. The outside crust was crispy and buttery, while the inside, ultra-soft and spongy. It was the perfect, heavenly combo with the accompanied Apple Banana ice cream (choice of Vanilla, Apple Banana, or Lilikoi). I also highly recommend the Plantation Iced Tea with a scoop of Lilikoi sorbet. It is sweet, cooling, and delightful. If you want something less sweet, try the Mango Iced Tea! There is also a really nice and breezy patio to casually sit and eat. It overlooks a big grassy area and some of their crops in the distance. A pretty, little getaway off of Kamehameha Hwy! I tell you, folks, it is a must try! 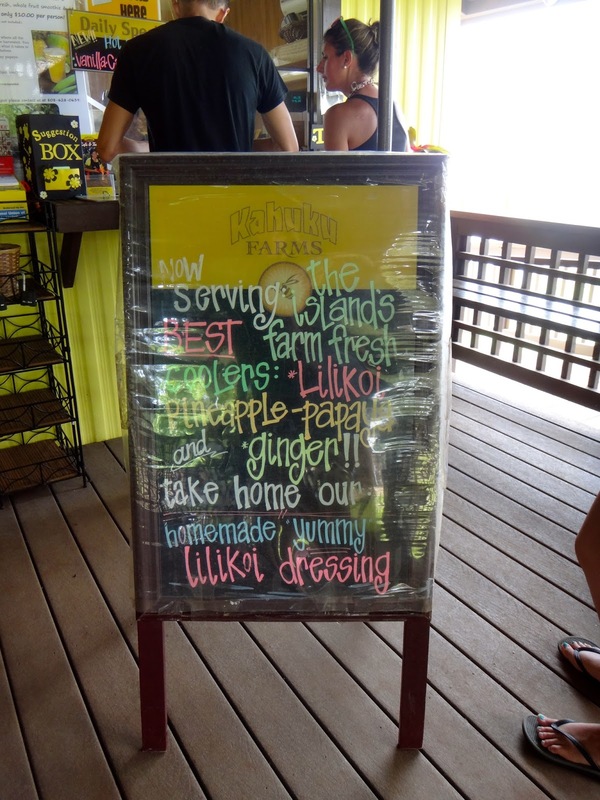 Get your Garlic Shrimp, and then stop at Kahuku Farms for dessert. Or if you still have room, get that Veggie Panini. I will have to get back there soon! Fried Banana Bread ala modé! Plantation Iced Tea with Lilikoi Sorbet!